Whether you’re a collector or simply one who is looking for a pretty pair of headphones, the best Hello Kitty headphones are worthy to check out. One of the world’s most famous, if not the most famous fictional cat, Hello Kitty is a Sanrio character that first made its appearance in the mid-1970’s. Originating from Japan, this cute cat has made its way to the hearts of many kids and adults from all over the world. Over four decades later, there are still thousands of Hello Kitty collectors and enthusiasts who would do anything to get their hands on anything that says Hello Kitty or has Hello Kitty’s face. Because of the character’s popularity, Hello Kitty headphones have become very popular too. There are, in fact, so many models of Hello Kitty headphones in the market today and if you will have to choose just one, you might find it quite difficult because everything just seems so lovey. To help you choose, you must first determine what you need the headphones for. Will you buy these headphones because you are a collector? Or are you getting a pair of headphones so you can use it? Are you getting one for yourself or are you buying these headphones for your child? Of course, kids are still the number 1 target market of these Hello Kitty headphones. To ensure that you’re getting the best Hello Kitty headphones, here are some characteristics you should be looking for. Design – The design is an important quality you should be looking for. Is it pretty enough for you? Of course, the style and design is purely subjective. You can choose from a wide variety of styles and colors of Hello Kitty headphones according to your preference. Sound Quality – Just like any pair of headphones, the sound quality should be decent enough. When it comes to Hello Kitty headphones though, since these are usually designed for kids, then you can’t really expect professional quality audio. It’s good that there are still some models that can produce clear and rich sound so you can have an enjoyable listening experience. Especially if you’re buying a pair of Hello Kitty headphones for a child, durability is important. Kids run around or may not handle their “toys” as carefully as adults would. It is best to choose a pair that’s made with durable materials. Comfort is important too. Most Hello Kitty headphones are lightweight, have adjustable headbands and cushioned ear cups for maximum comfort. Size – Again, Hello Kitty headphones are usually designed for kids. If you’re a grown adult and you’re looking for the best Hello Kitty headphones, it is best to look at its dimensions or if the pair at least has an adjustable headband to make sure it fits you. If you’re buying one for a child, make sure it’s small enough so that it can fit securely at all times. Without any doubt, the Hello Kitty DJ Style Over the Ear Foldable Headphones is most deserving to be on top of this list of the best Hello Kitty headphones. It is worthy to mention that it has already received a very impressive average rating of 4.8 out of 5 stars from customers. 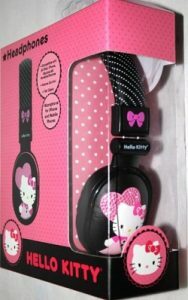 With the signature Hello Kitty logo and classy black and pink full-sized headphones design, this pair is perfect for kids and adults alike. Even better, this is not just any mediocre pair of headphones. The Hello Kitty DJ Style Over the Ear Foldable Headphones actually produces impressive audio quality, thanks to its 40mm speakers made of state-of-the-art neodymium. It is comparable to more expensive pairs, considering that these headphones will only cost you so little! Since it’s a closed pair of headphones, you can expect decent noise isolation to keep excessive noise out and for you to enjoy more of your music. It is compatible with most music players, smartphones, computers, etc. with a 3.5mm jack. The Hello Kitty DJ Style Over the Ear Foldable Headphones is foldable so it’s easy to store or keep in your purse when you’re on the go. The headband size is adjustable too through the earpads, which makes it perfect even for kids who have a smaller heads. Since this design is preferred mostly by the young ones, comfort is important. The full-sized headphones would fit securely even on smaller ears. For added comfort, the headband is padded and the earphones are also generously padded so you can use it even for hours on end. 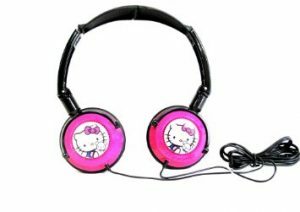 Most definitely, the Hello Kitty DJ Style Over the Ear Foldable Headphones is the best choice you have when you’re looking for Hello Kitty headphones for yourself or for your child. Another sure hit for kids and the kids at heart is the Hello Kitty DJ Style Headphones 11609-HK. This pair of black and pink headphones is even more affordable. Another model, the 11609N-BLK is plain black with the same Hello Kitty design with an attractive price tag. With satisfied reviews from almost 100 customers at an average rating of 3.9 out of 5 stars, for its price, you probably won’t expect too much from this pair; but once you try it out, you will realize that it’s actually a good one. The Hello Kitty DJ Style Headphones 11609-HK is recommended and designed for kids aged 6 and above, however, adults are more than welcome to enjoy these headphones as well. These full range stereo headphones allow you to enjoy any type of music you like listening to. Of course, it is way more affordable than other pairs of headphones so you cannot really expect the Hello Kitty DJ Style Headphones 11609-HK to sound like an expensive headphone. But still, it is more than enough to give you rich and clear sound that goes easy on the ears. Its 3.5mm stereo jack is compatible with most portable music players, gaming devices, smartphones, tablets and more. The Hello Kitty DJ Style Headphones 11609-HK is very comfortable to wear for individuals with all ear sizes. The ear pads are cushioned for extreme comfort even when you use this pair for hours on end. Its foldable and compact design makes it easy to store away when not in use or to take with you inside your purse or backpack. It is lightweight yet durable so with proper care and handling, you can expect these headphones to last for years to come. If it weren’t for its slightly higher price, the Foldable Over-The-Ear Headphones Kt2091Mby Hello Kitty would have easily claimed the top spot on this list of the best Hello Kitty headphones. This pair has so far received a perfect 5-star average rating from customers, it looks very pretty and it works as advertised – there is nothing more really you can complain about as these headphones are simply perfect for kids, young adults and grown ups who are Hello Kitty lovers. 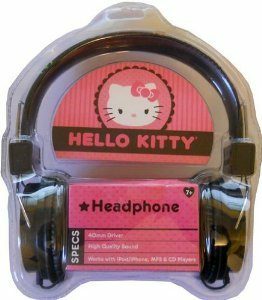 The sound quality of the Foldable Over-The-Ear Headphones Kt2091Mby Hello Kitty features neodymium drivers that make its stereo sound quality quite impressive. Frequency response is at 20Hz – 20kHz. It also has a noise isolation feature so you can cancel out excessive outside noise without having to put the volume too high – perfect for kids. It can even be used to take calls when attached to your smartphone. It is compatible with all portable devices with a 3.5mm plug such as music players, gaming devices, smartphones, tablets and more. The Foldable Over-The-Ear Headphones Kt2091Mby Hello Kitty is very comfortable to wear. It is lightweight, which makes it ideal for kids and its ear pads are generously cushioned so that it wouldn’t put much pressure on the ears even after using it for hours. The headband is adjustable so that it would fit all head sizes. There’s no wonder why this pair received perfect reviews! 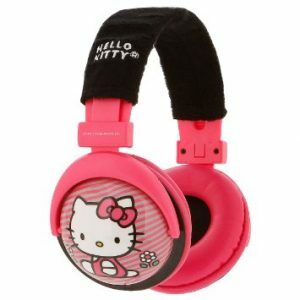 Most definitely, the Foldable Over-The-Ear Headphones Kt2091Mby Hello Kitty gives you great value for your money. 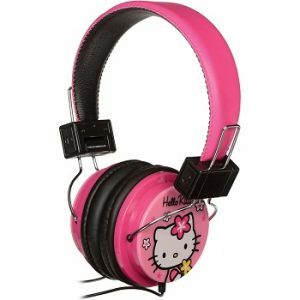 A best-seller when it comes to Hello Kitty headphones is the Hello Kitty Kid Safe Over the Ear Headphone 30309. Though it is labeled as “Kid Safe”, it doesn’t necessarily mean that these are only for kids. The headband is adjustable so even if you’re an adult who is a fan of Hello Kitty, you can also conveniently and comfortably use this. Over 1,700 customers rated this with an average of 3.8 out of 5 stars and have given such impressive reviews. With a number of other designs aside from Hello Kitty, most definitely, the young ones and the not-so-young ones will enjoy having this pair of headphones. The Hello Kitty Kid Safe Over the Ear Headphone 30309 works with all portable audio and gaming devices with a 3.5mm stereo jack. This means you can use it on a smartphone, tablet, gaming devices, music players and more. The sound quality is quite impressive too with its full range stereo sound that’s clear, crisp and rich. The ear cups are padded for extra comfort too. Most importantly, the Hello Kitty Kid Safe Over the Ear Headphone 30309 is built with the Kid-Safe Volume Limiting Technology so that you and your child’s hearing won’t be damaged due to high listening volumes. This technology automatically limits the maximum audio volume to just 80% of the original. Among the many reviews coming from owners of the Hello Kitty Kid Safe Over the Ear Headphone 30309, the most common comment they have given is that these headphones are very comfortable to wear. Even a child won’t mind wearing this for hours in the plane or in the car or while playing games or watching videos at home. These headphones are truly worth every dollar spent. The Hello Kitty Headphones (HK-36429) will surely make any Hello Kitty fan delighted. Whether you’re buying a pair for yourself or you’re getting one to give as a gift, you will love how the Hello Kitty Headphones (HK-36429) sells just within your budget. This all-pink pair of headphones is very attractive as expected. If you’re a Hello Kitty collector, you’d definitely want one. It’s a great pair of headphones for daily casual use too. Of course, you can’t expect build and sound quality the same as a pair of hundred-dollar headphones, but if handled with care, you can expect these headphones to last for years. These full range stereo headphones actually produce a much more impressive sound quality than expected. While still not comparable to more expensive pairs, it is clear, crisp and rich enough for you to enjoy your favorite music. Even owners who left their feedback on these headphones also say so. Built with a 3.5mm plug, the Hello Kitty Headphones (HK-36429) is compatible with most portable devices. You can use it on Apple or Android smartphones and tablets, Blackberry phones, music players, gaming devices and many more. You can even use it on your computer or laptop if you wish. This pair is built with comfort in mind. Since kids and young ladies are the people the designers have in mind, they made sure that these headphones are designed ergonomically for maximum comfort at all times. The ear cups are padded and so is the adjustable headband. Even better, these headphones are foldable which makes it ultra-portable. Here’s a pair of Hello Kitty headphones that fashion and style-conscious young ladies will surely fall in love with. The Hello Kitty HK-ZEB-WM Headphones with Zebra Design is uniquely designed so that Hello Kitty lovers of all ages can fashionably wear and enjoy it anytime, anywhere. Built with a 3.5mm plug, this pair of headphones is compatible with all smartphones, tablets, portable gaming devices, music players and other devices that come with a 3.5mm jack. Sound quality is quite impressive with the Hello Kitty HK-ZEB-WM Headphones with Zebra Design. These headphones might be one of the more affordable pairs in the market so you are probably not expecting much but you’ll be pleasantly surprised how its audio quality can produce rich, clear and crisp sound that’s comparable to pairs double its price. 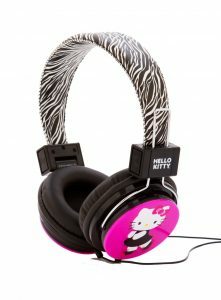 Even better, the Hello Kitty HK-ZEB-WM Headphones with Zebra Design is durable too. You can keep it in inside your purse or your backpack without worrying it gets crushed too easily. However, it is still highly recommended to keep it in a carrying case and for you to handle these headphones with care so you can enjoy it for many years to come. Most importantly, the Hello Kitty HK-ZEB-WM Headphones with Zebra Design are very comfortable to wear. Whether a child or an adult chooses to wear these headphones, you can expect maximum comfort at all times with its adjustable headband, padded ear cups and lightweight design. They say that if you want high quality headphones that can produce great audio and are meant to last, then you should be prepared to spend a lot of money. Thankfully, you can get the best of both worlds with the Hello Kitty HK-39109-WM Headphones with Peace Design. Built with 40mm drivers, you can expect high quality sound for this pretty pair of headphones featuring an adorable Hello Kitty design. So whether you’re getting one for yourself or you’re getting a few to give away to friends on special occasions, you can make most out of your money with this pair. The Hello Kitty HK-39109-WM Headphones with Peace Design is compatible with all music players, portable gaming devices, iOS and Android smartphones and tablets and more as long as the device has a 3.5mm jack. It is made with durable materials to ensure that you can use it daily without worrying that it will give up on you too soon. Just make sure you handle it with care and don’t abuse it so that it will last for years of enjoyable music listening or gaming. Furthermore, the Hello Kitty HK-39109-WM Headphones with Peace Design is designed ergonomically to fit most head and ear sizes. The headband is adjustable so whether an adult or a child will be using it, it will still fit securely and comfortably. The ear cups are generously cushioned for maximum comfort and the actual headphones and built with lightweight materials so you can wear it for hours on end without getting your head tired or your ears hurt. 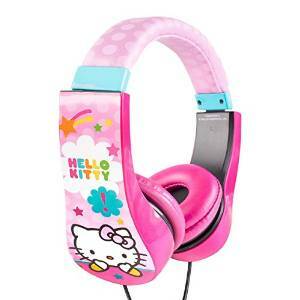 Another very pretty pair of headphones that both kids and adults will love is the Hello Kitty Headphones HK-35609. It has a black body with white dots on its soft, adjustable headband. There’s a pink bow on each side for an added touch of Hello Kitty cuteness and Hello Kitty with a sparkly heart on each of the ear cups. These “Aged Up” headphones have received quite a number of impressive reviews from customers and other owners who left their feedback on different websites. Compatible with all smartphones – iPhone, Blackberry, Android, etc. – as well as music players, portable gaming devices and practically any device with a 3.5mm jack, the Hello Kitty Headphones HK-35609 is your ideal daily causal pair that will surely bring out the fun style in you. The sound quality is quite good considering its low price – you’re getting rich, crisp and clear sound even with higher volumes. This ultra-portable foldable pair of headphones is very comfortable to wear too. It is made with lightweight but durable materials, cushioned ear cups and a soft headband that lets you wear it for hours on end without any problems. As an additional feature, the Hello Kitty Headphones HK-35609 features flat cables, which are known to be durable than regular ones. Furthermore, it comes with a built-in microphone so you can make and receive calls on your smartphone hands-free. It also features a volume control button so you won’t have to reach out to your device when you need to adjust. Black and pink is probably one of the most common color combinations when it comes to Hello Kitty headphones. This is probably because Hello Kitty just screams pink and the black color makes the design easy to match with different colors of players and portable devices, as well as your outfit for the day. 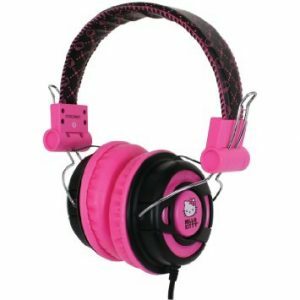 The Hello Kitty DJ Headphones HK-38429 is one of the several black and pink headphones on this list and when it comes to style and design, it stays quite competitive because this is indeed an attractive pair. The Hello Kitty DJ Headphones HK-38429 features large full-range 40mm drivers which gives you that super clear and rich audio quality. 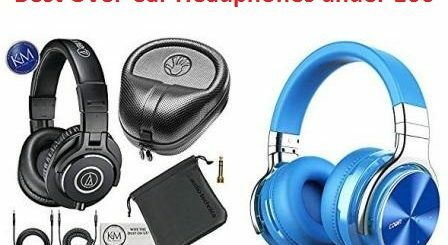 Whether you’re using these headphones to listen to music or to play games, you will definitely enjoy the superior sound experience you can get. It is also compatible with all kinds of portable device with a 3.5mm stereo jack output such as smartphones, tablets, music players, gaming devices and more. The ear cups swivel DJ-style and the headphones also come with an impressive sound isolation feature so you can focus on the music more and excessive outside noise less. Made with durable yet lightweight materials, you can expect maximum comfort even when wearing the Hello Kitty DJ Headphones HK-38429 for an entire day. The ear cups are generously padded and the headband is adjustable for a more secure and comfortable fit. The headband is made with metal but covered by soft and smooth fabric. The headband bends easily too which makes it all the more durable. On a list full of pink and black/pink headphones, finally, here’s a red pair of Hello Kitty headphones. It is the perfect gift for Hello Kitty collectors but if you’re looking for a pair of pretty headphones for yourself, then this one’s a great option too. These headphones are ultra-portable due to its foldable design. 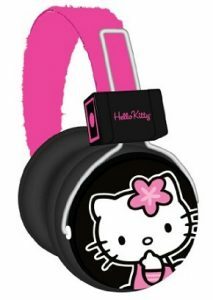 The Hello Kitty Foldable Stereo Headphones 35009R are full range stereo headphones and its ear cups are designed DJ-style with a 90-degree swivel. As long as you handle it with care, it stays durable and functional for many years of daily casual use. In fact, since these headphones are designed for kids, it is built with extra-durable yet lightweight materials. The ear cups of the Hello Kitty Foldable Stereo Headphones 35009R are generously padded so that you can stay comfortable even if you use it for an entire day. It has an adjustable headband too for a more secure fit. As mentioned, it is quite light so even kids won’t feel tired while wearing it for hours. The sound quality is more decent than expected. You’ll appreciate how you can get rich and clear sound from this pair. If you’re looking for an affordable but decent pair of cute Hello Kitty headphones, this is a good choice for you. Every dollar you spend on the Hello Kitty Foldable Stereo Headphones 35009R truly is worth it.